On July 16th 1970, Capt. Nathan Green of the British Infantry disappeared whilst on exercises in the Syrian desert after retiring to his tent with a strange box that he discovered half buried in the desert sands. 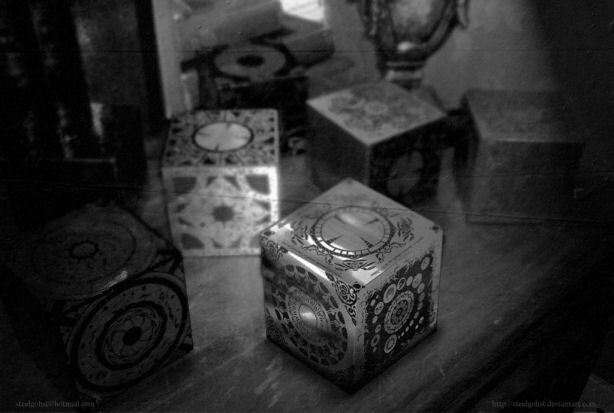 The box was later identified by photo analysis as Magdalene's Undoing - a Lemarchand construct made in the Mid-18th Century for Lara Ryan in New York. For many years, Capt. Green's disappearance was a complete mystery - but recent information leaked to us by sources close to the man himself would suggest that the Captain did not simply vanish on that fateful night, but was offered a choice and made a decision that has affected the lives of many people since. The year 2000 saw the founding of N.G. Industries, funded in part by the sale of The Box of Gateways. 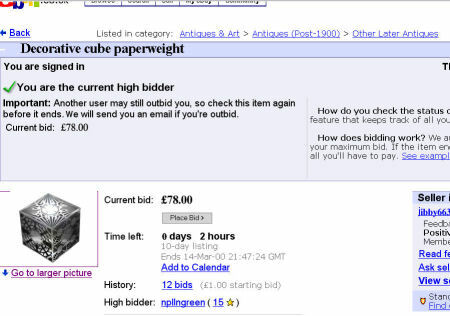 The Box sold in Paris after it was bought by NG for £78 in an online auction. A study of the screen shot of the auction shows the winner to be npllngreen. NG has since collected many LeMarchand boxes including The Troubled Walk - "The Box Of Grief". It is thought that prior to the sale of much of his collection, with the exception of The Distress Configuration which he retains, he may have been the owner of more Lemarchand Configurations than any single person in history. There has long been speculation as to why he should choose to sell off so much of his collection after going to such lengths to build it. However, recent information suggests that his interest was purely in their workings, and he had learned all he could from them. 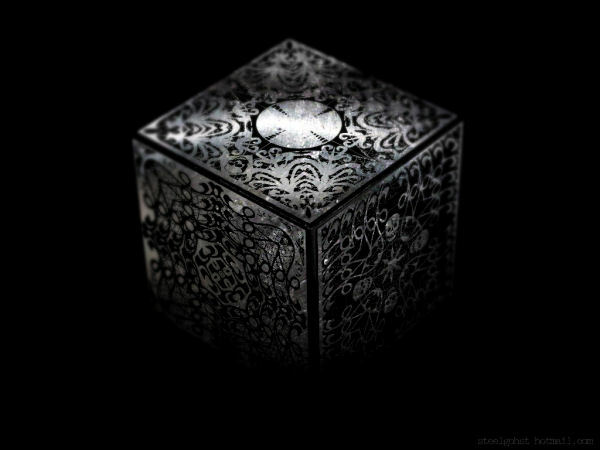 This lead to the sales to fund his latest venture, the creation of an entirely new box in the Lemarchand style. 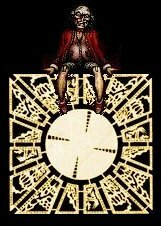 According to our source, formerly head of new acquisitions research for NG Industries, his first work The Box of Gateways was a deconstruction and re-assembling of the original construct by Albertus Magnus. The exterior was identical to the original, but the method of opening being entirely new - Lemarchand is also thought to have done the same in his early career as a box maker. It was this box that NG sold privately in Paris. Editor's Note: This student "deconstruction and re-assembling" of past works indeed seems to be a common trait among the box makers. Philip LeMarchand not only reconstructed his own version of Albertus' Box of Gateways, but he also reproduced The Elegy Yantra, which was first created by Indonesian craftsmen in the late bronze age (2500 B.C.). 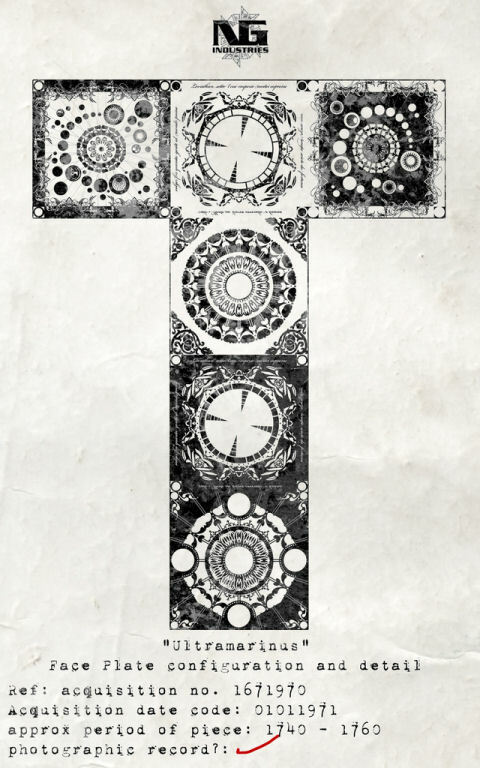 LeMarchand was also admittedly influenced by the box work of the Rosicrucian Reiss Kunst. 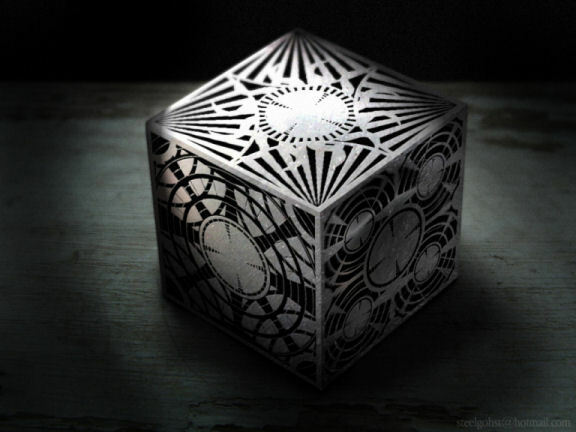 His second work was the construct known as The Unknown Box, which is again thought to have been made by the deconstruction and re-making of an original Lemarchand piece. The most recent box, Ultramarinus is thought to be his first wholly original piece. It's name comes from the Latin for the color Ultramarine (ULTRA - beyond, MARE - sea, so called because the Lapis Lazuli from which the pigment was made was originally imported from Asia). Apparently he does not seem to want to sell his creation, but has instead crafted it as a personal piece, in much the same way that Lemarchand created The Troubled Walk for himself. 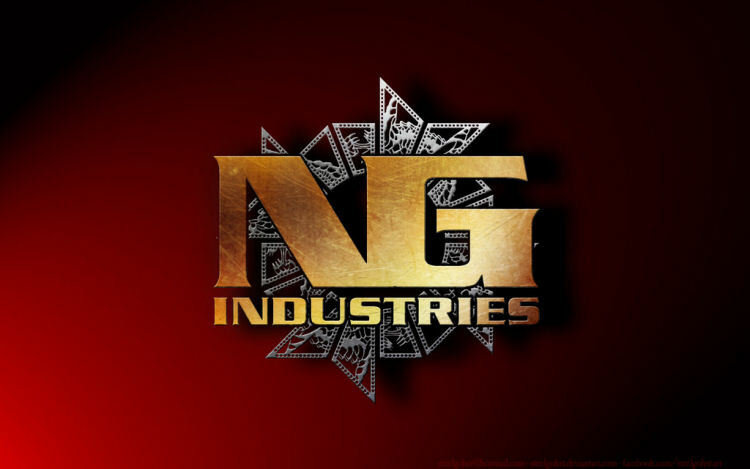 Apart from the user name on the auction of The Box of Gateways and the testimony of NG's employees, clues can be found throughout the documents of NG Industries that lead to NG being none other that Capt. Green himself. The Ultramarinus documents, for example, have false information dating the piece as 1740-1760, but also contain the date of NG's disappearance from Syria in its acquisition number -"1671970"- or '16th July (7) 1970' similarly the same date crops up in other documentation; Zosimus, for example, contains the code "1671970" on virtually every piece of documentation relating to it. Clearly the date holds great significance to him, as the date his life was changed irrecovably. The biggest difference between NG and Lemarchand seems to lie in their intent. Our source states that NG was a driven and intense man, who seemed to swing between fear and exuberance, but he was fair in all things. Whereas Lemarchand's constructs are designed to open a gateway for Leviathan and his servants, it would appear NG creates boxes that are intended to do the opposite. Perhaps NG was working towards an 'anti-Lament', for want of a better term. A construct that not only closes Leviathan's portals but also has the power to destroy those who would try to enter our world though them. Indeed he may have already succeeded with Ultramarinus. This would also explain why he kept The Troubled Walk. 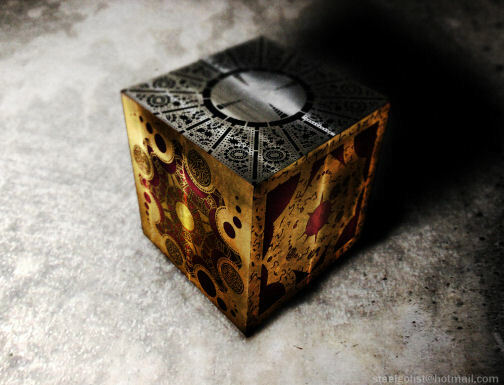 There are some who are of the opinion that Lemarchand created that particular box as protection for himself, a guarantee that he would not be taken for a fool by his masters. That would explain why he kept it on his person at all times, and it would also explain why NG has kept it. Perhaps Lemarchand made some small miscalculation in The Troubled Walk , which NG has corrected in Ultramarinus? Perhaps the world has now heard the last of NG. He may be living out what remains of his life free from fear. Perhaps not. Only time will tell. Winter 2008 - With the creation of Seraphim or "The Divine Configuration", the goal which Captain Nathan Green had been working towards for nearly 40 years was complete. 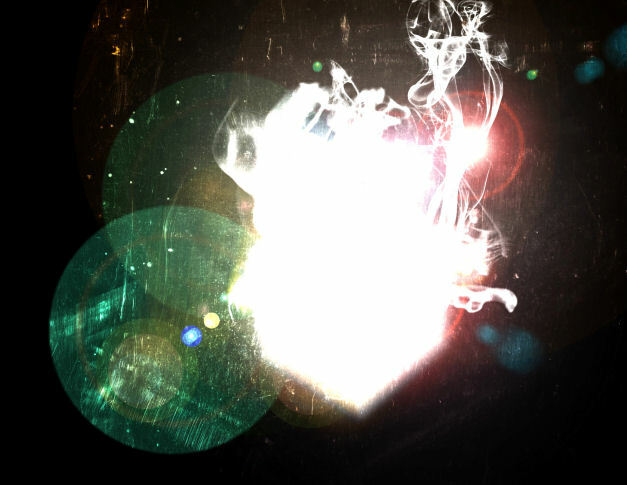 Pyramid-Gallery has recently acquired limited access to Seraphim. Attempts to document it's surface have proved thus far an impossible task. 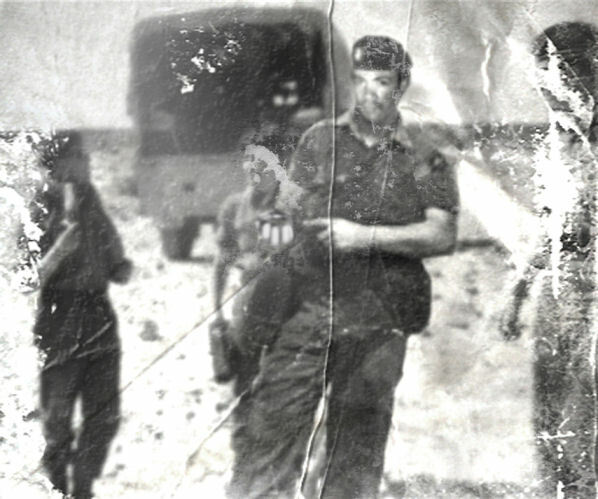 All photographs are difficult to make out, returning only images of dazzling light upon the damaged film, even when no such light is apparent to the unaided eye. Digital photographs return only blank white images, and attempts by our artists to sketch the box exterior have proved equally fruitless, with the mental image slipping away even as the eye turns to the paper. On occasion, it has been necessary to shake research artists from an apparent stupor as they gaze blankly with faint smiles at the empty sheet before them. 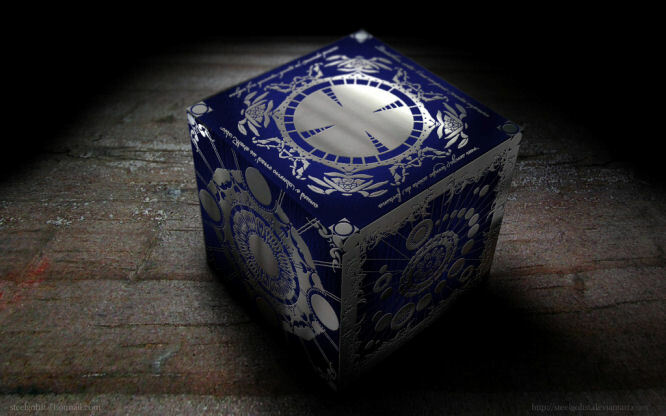 The box has now been returned to NG Industries, and they assure us that any further discoveries will be shared with us. Capt. Green himself is of the opinion that Seraphim either does not wish to be copied, or cannot be copied, as "She is the only one of her kind."